I was just drinking a simple glass of wine from the Aude region of France and realize that it’s not half bad: beautiful aroma, tastes delicious, velvety moistness which doesn’t feel like a dry napkin on your tongue when you swallow it. A fine product therefore, produced in large quantities perhaps, but with a large degree of craftsmanship. You could say that the producer knows when something like this will be drunk: on an ordinary weekday or at an everyday party. Nothing wrong with that. No pretensions and a good accompaniment. Comparing this to the product of a garden may seem a bit of a stretch, although… there are many flavours of wine and gardens too. It’s nice if they surprise you a little, evoke pleasant amazement and prickle your senses imperceptibly. Several years ago, I attended a lecture given by a garden and landscape architect who ‘did a garden’ now and again. He normally did large-scale work therefore: urban design, sustainable landscapes, an area where a museum is being planned. It was a fascinating lecture, but what stayed with me the most was the story about a back garden of a terraced house measuring 6 x 10m. His ordeal was to sketch shapes over and over again, only to keep arriving at the conclusion that he wanted to shift the physical borders in the garden. That wasn’t possible, as those borders were fixed! It went to the right and left towards the rear, and there was a diagonal line ten metres in. He ultimately had to tell his client that he could only suggest a lawn for the entire 60 square metres with stepping stones leading to the garden gate. His conclusion reminded me of the black plane of the painter Malevich, a black square which once fascinated me in the museum, in the sense that: when you know everything you arrive back at nothing. So, I kept musing on his visual reaction to this garden, and to be honest I was also interested by it; it intrigued me. Hence, that comparison with the work of that painter. My final conclusion was, however, that this is possible and has a fascinating added value if it is translated into a painting. Living and gardening in that space, however, is another thing entirely; a lot more is possible than this somewhat empty, serene atmosphere and we also want to live in that 60 square metres. The wish of every landowner, plant lover or ‘simply’ bon vivant, is that you can look at fascinating corners from a good seating area and/or have a beautiful view; that you can take a short or long walk during which you notice yet another nice detail every day, and subconsciously experience that your outdoor space is in balance. That does mean, however, that both the fenced off garden and the unbounded landscape require content; a space with numerous flavours and fragrances, which effortlessly act on your primary senses and have a beautiful long-term aftertaste. Visually captivating therefore, and also catering for physical needs in a subtle way. The comparison with art is not coincidental in my opinion. As a garden and landscape architect, you are a free thinker in the outdoors. Garden and landscape architecture is a form of art in nature. You search for a balance between greenery and your hard materials (stone, wood, steel) for your client, which you apply to terraces, paths, bridging, differences in height, etc. 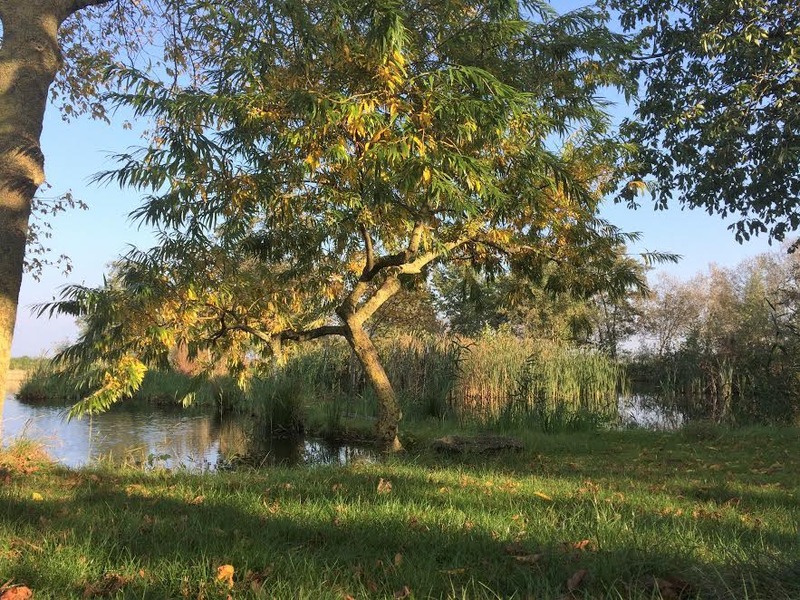 Free art uses nature as a space in which it may exhibit and there doesn’t necessarily need to be an ‘interactive’ reaction from the art on the open space. That doesn’t change the fact that the artist searches for the best spot for his or her work and senses where his or her work looks the best. Every free artist and garden and landscape architect has a particular feeling at a location, an outdoor space. 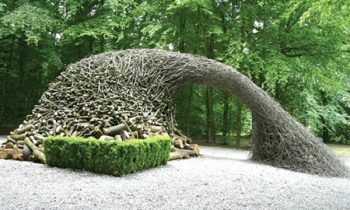 They have their own vision on how to connect hard/soft lines and planes with the greenery, and manage to create their own style. 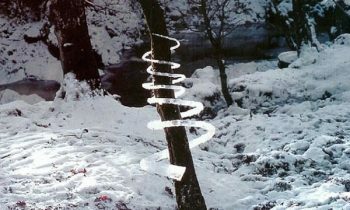 Andy Goldworthy is a nature artist. This is something slightly different. Nature is his tool, his material. His stage is the open space. The images of this English artist from Leeds in West Yorkshire are mostly temporary. They decay within a short space of time or sometimes already during the act of creation. 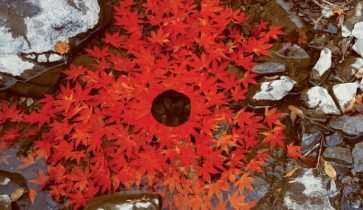 He decorates autumn leaves like paint on a canvas of clear water, creates the most fascinating images with icicles, which subsequently melt away once again, making you realise again during that process that water which becomes hard then melts is a beautiful little miracle. You can see that he understands the material in his images. You know that he touches and smells the stone and the trunk, the branch. He is one with his material and can therefore connect with the outdoor space. The boundary between his work and the limitless space does not exist or is transparent at most. His images challenge that outdoor space or fraternise with it. Personally, I also smell the fragrances when I look at the flat images in his books. Twenty years ago, I discovered this phenomenon and sharing this with you, I feel a deep affinity once again. I think that you may recognise it in my work. When designing an outdoor space, you make use of this quality. All other hard materials like concrete, stone, steel and wood also have a smell, colour, an energy and whichever of these you use relates to the texture of your planting. It is this content that stays with you; which you continue to muse on with a blissful feeling. Like the aftertaste from an extremely good wine that holds more memories than just the wine itself. 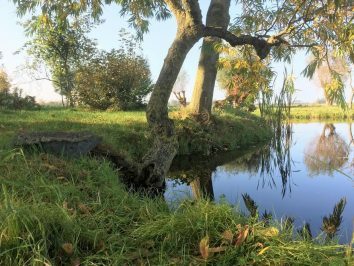 You could easily fill an entire book with all the species and characteristics of the Salix family, from the Creeping Willow to the Pollard Willow and Weeping Willow. Many family members are real beauties with major advantages, such as being easy growers, having characteristic shapes, and the ability to use and combine them in many situations with different plants in the garden, park, landscape, village and city. 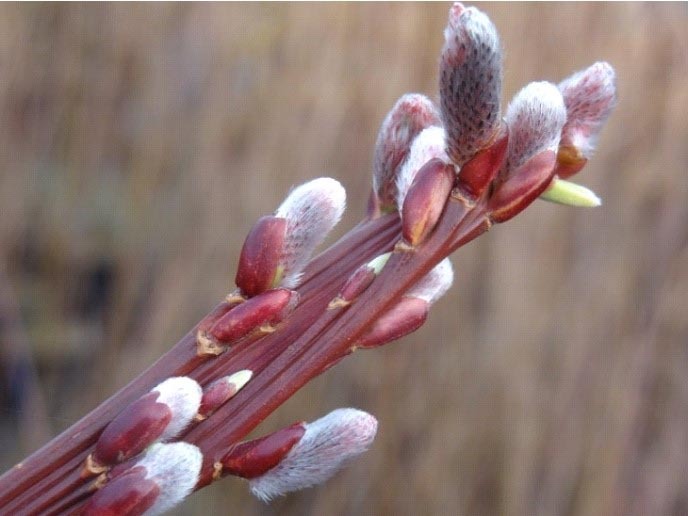 An undeservedly unknown member of this willow family is the Japanese Fantail Willow, the Salix sacchalinensis ‘Sekka’. ‘Fantail’ refers in this case to a tangled fasciation of branches, which fan out as it were. 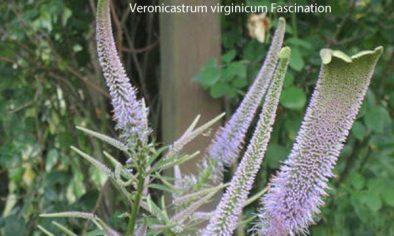 This occurs in numerous species of plants, such as the Veronicastrum virginicum ‘Fascination’, Buttercup and Lespedeza thunbergii, although not in branch shape but flower shape. 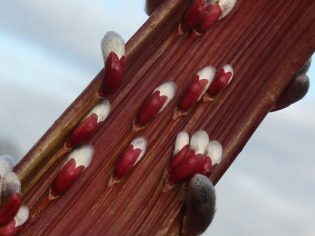 The shiny, mahogany brown sticky branches are covered with silver catkins. This is in the early springtime, before the leaf is formed and the shrub displays its graceful and fanciful exterior. 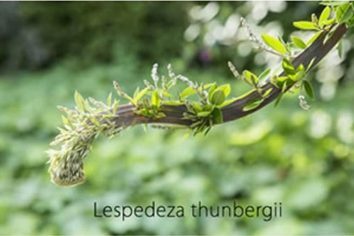 It becomes a sizeable shrub, which grows approximately four metres high and just as wide, and is suitable as a solitary shrub that connects water with land. A meeting herein of a designed line with or without function can be a happy marriage. The water-loving willows also have water roots, which is to say that roots form at the eyes (buds) where the branches touch the water. This also yields a beautiful present: when the sun shines in the water, you see the shoots hanging at the base of the trunk. 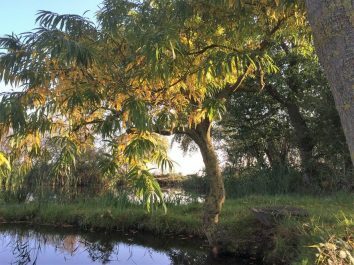 At the right spot, this Japanese Fantail Willow benefits from creative pruning, recognisable as a self-moulding artwork on friendly terms with land and water.